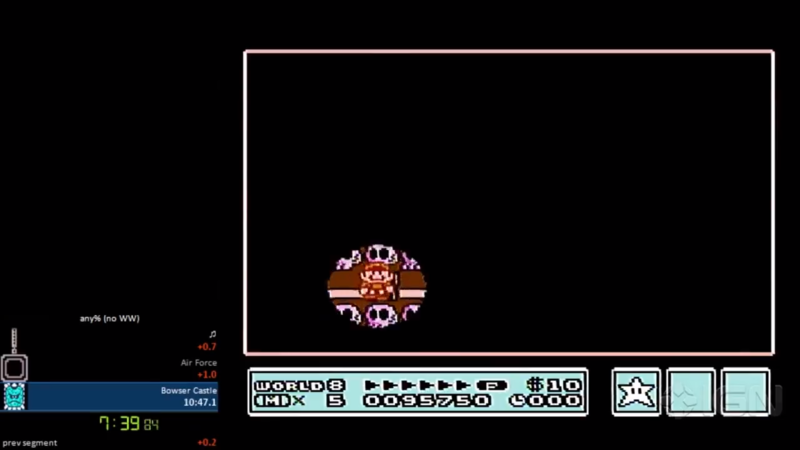 In a certain section of World 8's map, the screen is black except for a small circle surrounding Mario (as seen below during this speedrun). After doing a little research, I discovered that the game's cartridge contains a special mapper chip. This mapper, labeled MMC3, allows the generation of raster interrupts which are normally unavailable on the NES. In other words, the CPU can be interrupted, at most, once per scanline. Code may then be placed inside this interrupt to adjust certain PPU registers on a per-scanline basis, allowing for visual effects such as (presumably) the tunnel vision effect seen above. What I don't understand, however, is how this specific effect was achieved (i.e., exactly what PPU registers the raster interrupts modified, if raster interrupts were even used at all). No MMC3 tricks are used for this effect; just standard background and sprite manipulation. Tiles that are completely invisible are replaced with a blank tile, while black sprites forming a circle outline cover the partially-visible tiles. Not the answer you're looking for? Browse other questions tagged nintendo nes or ask your own question. How did Konami games recognize the famous cheat code? Why did Nintendo commission Sony to create a disk reader if the Famicom already had one?